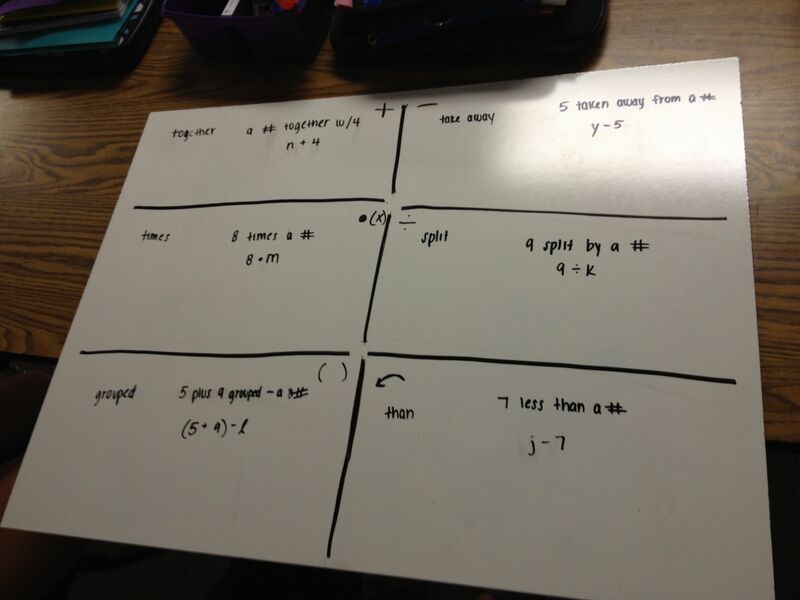 I have taught translating verbal models into algebraic expressions for many year. However, with all of the new idea garnered at TMC and through Twitter, I really wanted to do something new this year. I loop with 6th and 7th, and my 7th have had this lesson before. I was sure they forgot some things, but didn’t want a vocab/lecture lesson. I decided to use my Mega White Boards that I made after reading Frank’s post and ended the lesson with Cheesemonkey’s block game. The entire day was a fabulous success, and I really can’t say enough good things about these giant boards. 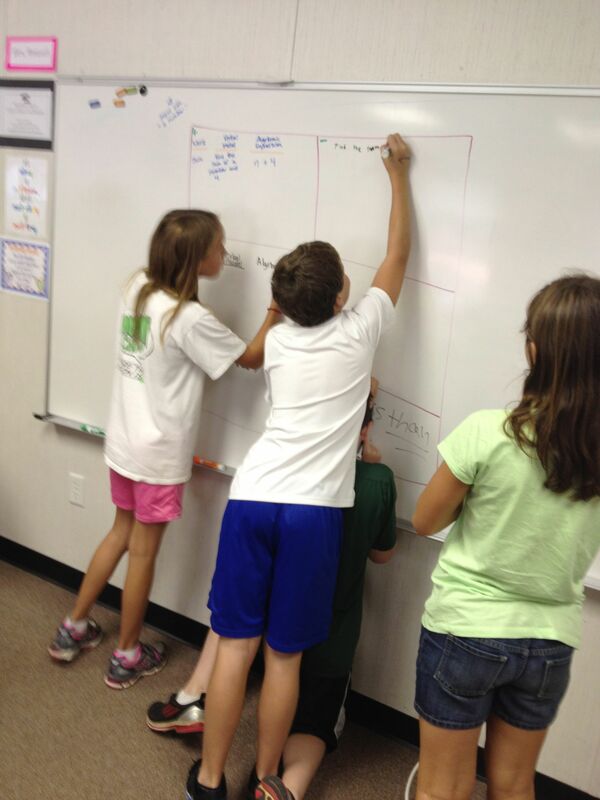 They are large enough for students to work in individually AND together on them. 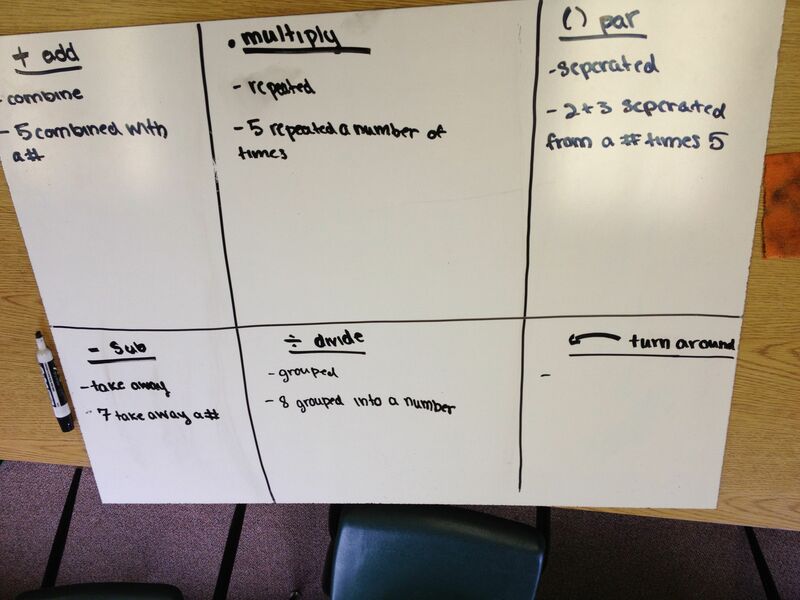 I had each group separate their board into 6 parts. They put math symbols in each part. I used addition, subtraction, multiplication, division, grouping symbols, and “turn around words”. For each section, the had to come up with a word that expressed the symbol, a verbal model (word problem) and an algebraic expression. Since it would be an algebraic expression, it had to have a variable in it. At first students picked which one they would do. I heard, “I’ll do addition, you do subtraction.” But almost immediately they were brainstorming to create the phrases together, especially on the harder ones. The groups had a pretty easy time with the first four, but got stuck o n the last two (grouping and turn around words). I’m not sure who thought of it first, but soon all of the groups were in the “Student Center” searching for their Math Reference Notebooks that they made last year (win!). I did not tell them what to look for, so I was very happy that they knew not only where to look but WHAT they were looking for. 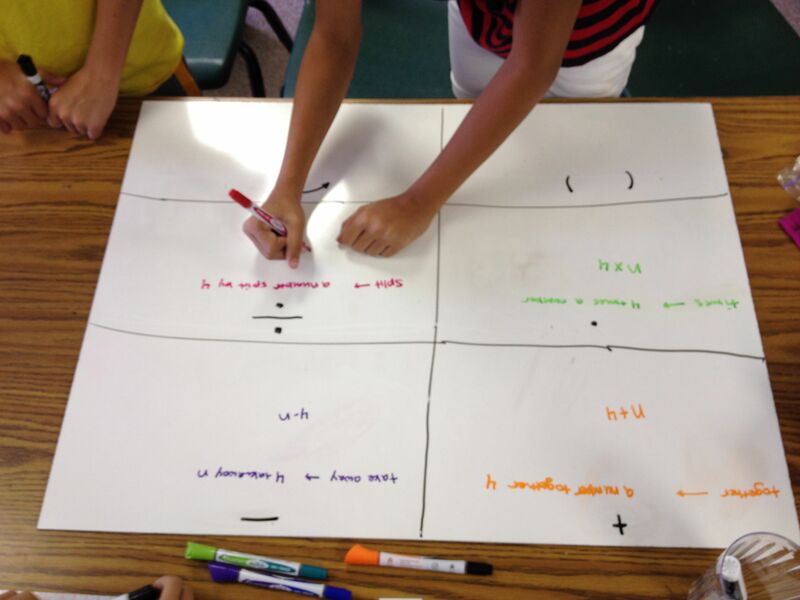 Some students even found the Math Into Words poster on my wall! Win! 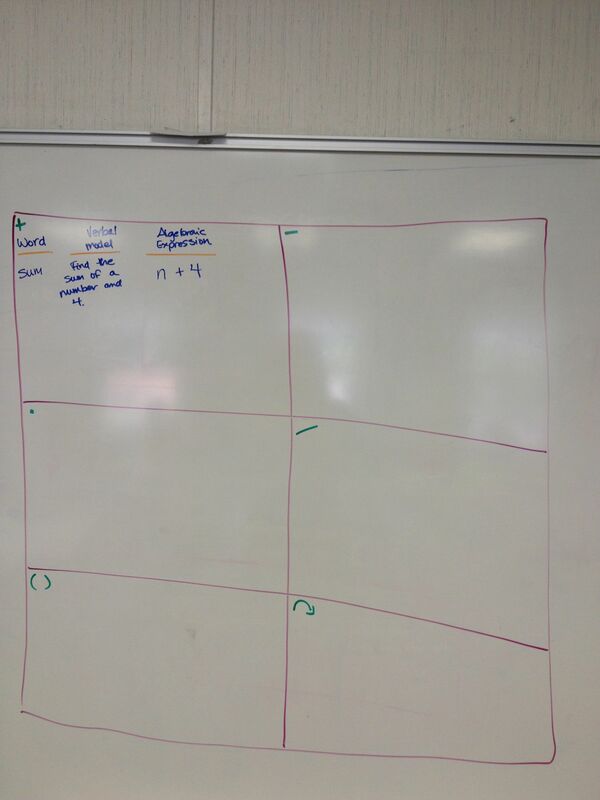 After they were finished I had the groups come up and fill in the grid on the board (one group per grid). 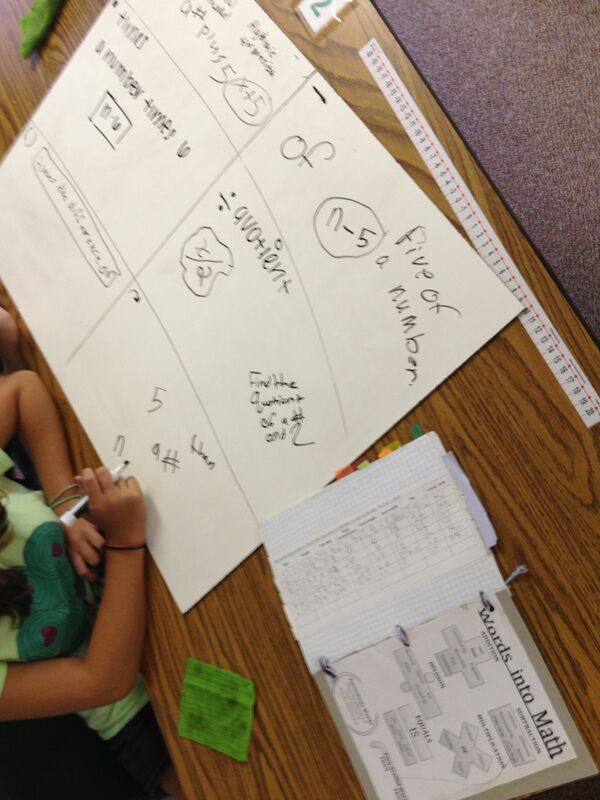 We discussed their expressions and brainstormed more words. 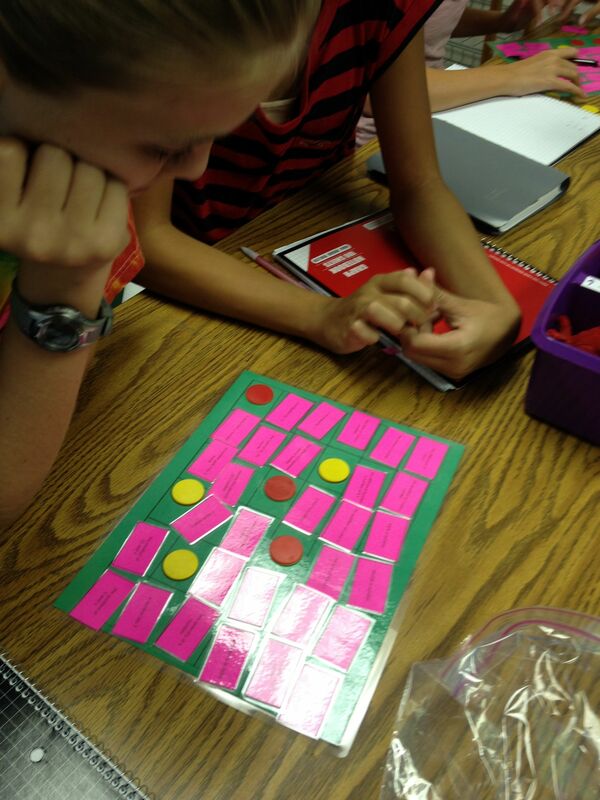 Then, I gave them a new “Words to Math” graphic organizer to glue into their interactive graph books. 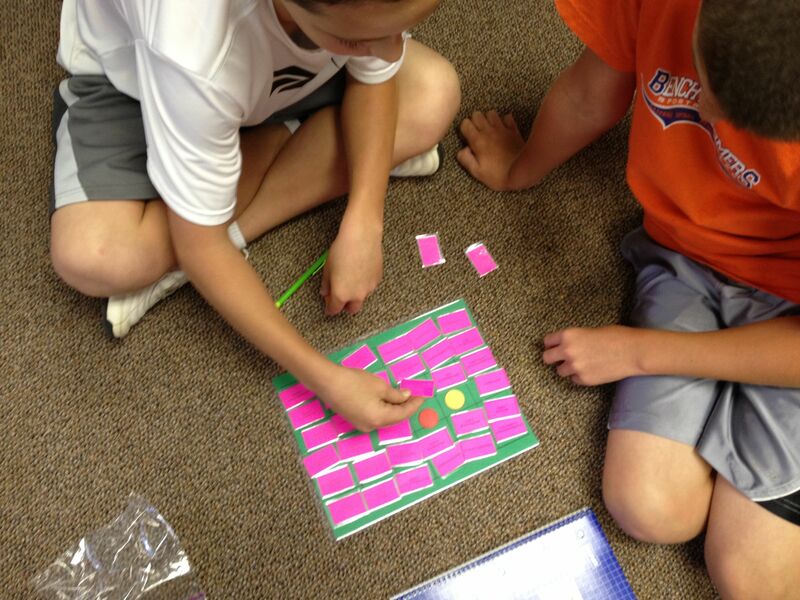 Finally, they were ready to play Algebraic Expression Blocking game from Cheesemonkey. We didn’t have much time left at the end of class so I plan on breaking this game out again! 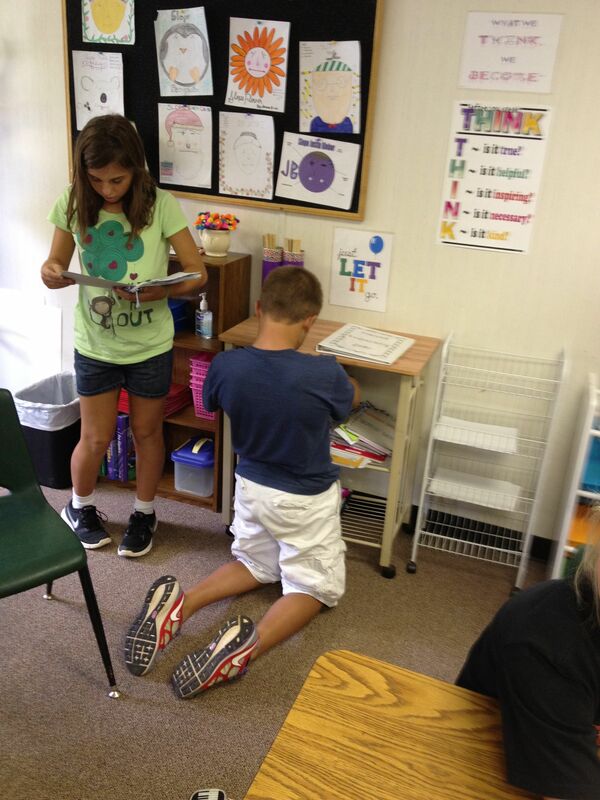 This entry was posted in Back to School, Organization by I Speak Math. Bookmark the permalink. These boards look excellent, and your blog always gives me nice ideas, thanks. I actually cycled out to my nearest bathroom/kitchen/plumbing store to check out “tile board”/”shower board” that Frank mentioned – they said sure, a big piece like you want will be £125 ($200 at today’s rate). It can’t be the same stuff. Did you make yours?